MiraCheck CoPilot is the future of aviation safety. Short of hiring a real-life co-pilot, this app is about as close as you'll come to having one, only in tablet form. MiraCheck featured in Aviation Consumer and IFR Magazine! Seeing and Hearing is believing! Our app is available on any mobile device! Talk to Mira - voice recognition - offline voice recognition on Android for the speed we need to support proves to be very challenging, although we are exploring. Support for Primary and Secondary voices for text-to-speech - currently it uses the default voice of the device. Multitasking and Overlay support - this is OS specific and proved very challenging with the plethora of Android devices. Built by pilots, for you. Check out what MiraCheck can do! Emergency procedures read in your ear in a matter of seconds. Keep your head outside! Slide the checklist over your favorite app so you don't lose context. The entire app was designed to work in this slim mode. Brilliant CoPilot, Mira, that always anticipates your next move. You have to hear it to believe it! Your CoPilot will read back an entire section for you just by clicking on the section title. Perfect for when things get a little hectic, like a go-around. World-class cloud editor for customizing all aspects of the checklist procedures. If you can dream it, you can check it! A community driven approach to allow the community to share their works of art. Templates that make great starting points for customization. Reusable section snippets (e.g. Speeds) to quickly build your masterpiece. Redundancy is an aviation hallmark. Have a printed backup copy with all of your customizations in case of a device failure. Laminate for durability. * CheckMate licensed content has limited print capability. "Information ON your fingertips." 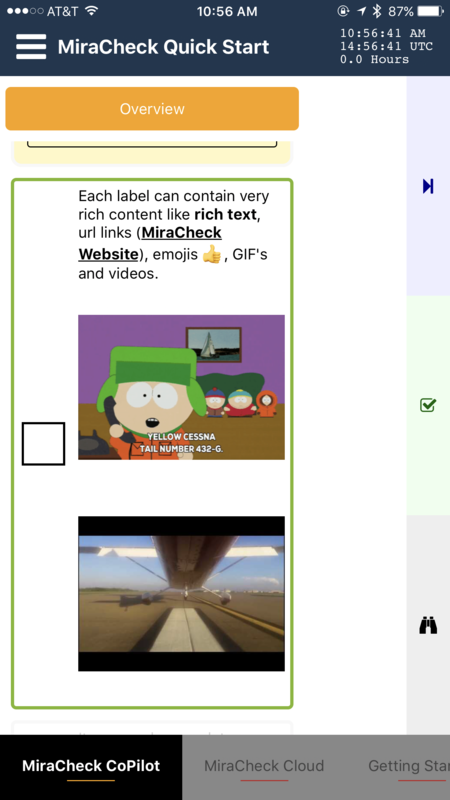 Checklist items can be text, URL links, emojis, GIFs, images and videos. Sometimes content doesn't warrant a checkbox. Inject labels such as warnings and other informational content. Designed for any size device, tablets and phones. Works equally as well on iOS and Android. Interacting with it couldn't be easier. The checkbox auto-scrolls to your thumb location and is always in the exact same spot. Button bar with most common functions optimized for multitasking mode. Emergencies a single click away. A cockpit (or your life) can get hectic. Never lose your place. Click the Locate button and no matter where you were at, the selected item will zoom into view. Remote control the checklist from your wrist. Great when you want both hands free. Just what it sounds like! Make your entire device a checkbox. No matter where you click, it can check. Crisp, clean, modern interface with a maniacal attention to detail. Many options to customize the app to your preferences. Horizontal, Vertical and Simple. Completely customizable to your workflow. More like a traditional print-based checklist. Collapsible panels to make navigating the content easy. Visually shows sections not started, started and completed. Also shows lists status with bar on button. Forces you to check before moving on. All other items are disabled. Use for critical items you never want to miss. Behind each item can be detailed comments in rich text glory. Shows an icon by items with comments. Just press-and-hold on the item to display. Allows personal notes to be taken and associated with each checklist item. These notes can later be reviewed in MiraCheck Cloud. Local and Zulu time as well as tracking your flight time based on starting the engine and shutting down! All interactions are captured for each session, which can be reviewed in MiraCheck Cloud. Great for understanding your workflows and improving the content over time. Pilots live in the clouds and now so do your checklist procedures. Introducing the MiraCheck Cloud. The most advanced checklist editing system on planet earth. Sign up for MiraCheck for FREE today! Manage all of your checklist content in one central place. All aspects of the checklist content can be customized. Each checklist is broken down into Lists (e.g. Preflight, Emergency), Sections (e.g. Start, Run-Up) and Items (e.g. Fuel - Both, Mags - Start). Recent, Featured, Trending, Recommended - discover checklist procedures that fit you. Discover checklist procedures across the MiraCheck ecosystem. The future of checklists is here! Technology is at the intersection of so many ground-breaking technologies, from the cloud, to mobile, to voice assistants, to computers on our wrist. MiraCheck combines all of these innovations to unleash the potential of such a simple concept. 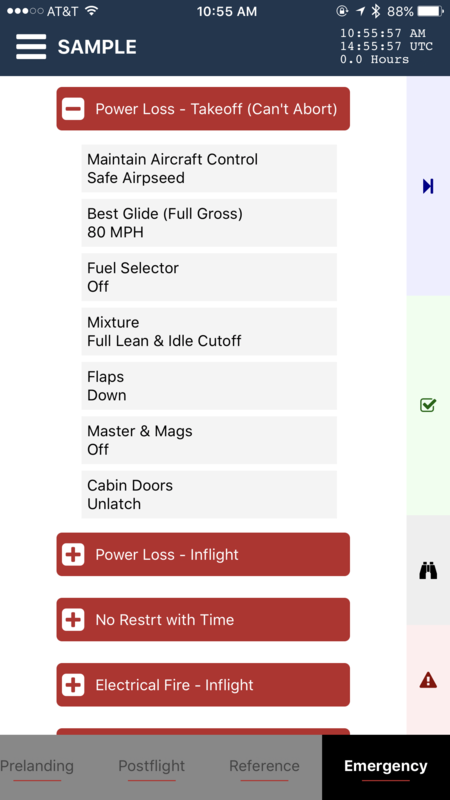 The companion mobile app MiraCheck CoPilot is where you interact with checklist procedures. Digital assistants are becoming commonplace, and MiraCheck CoPilot embraces this trend. It utilizes voice (Mira) to try to combat the complacency that can occur when you check the same items over and over. It was designed to take you through the content in the most efficient way possible. It also provides a framework for much richer checklist content. Items can be textual content, URL links, images and videos. More detailed rich content can also be associated with each item. 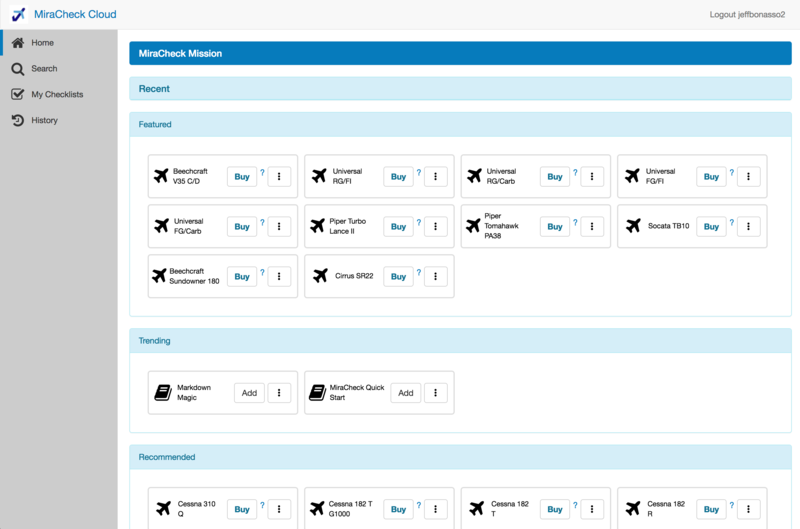 MiraCheck Cloud is where you discover, create, edit and share checklist procedures. MiraCheck Cloud aims to be a central hub for the community to share their expertise. It has robust editing tools as well as a powerful search engine to easily discover checklist procedures. The ultimate goal of a tool like MiraCheck is to reduce human-error and enable people on new procedures in the most efficient way possible. The ultimate vision is learning checklists. When you are initially learning a new procedure there is a lot of detail and it walks you through the process in a very methodical way. Basically, it can act as a performance support tool for real-time on-the-job training. As you gain more experience, then the checklist acts more as an accountability tool and as a tool to reduce mistakes. For this reason, checklist content for procedures should constantly be improved, and there are many features around this premise. 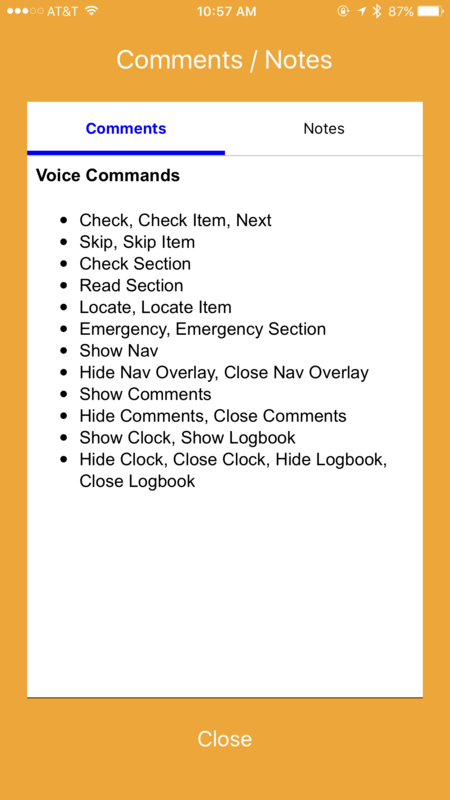 Every time you interact with a checklist a session is created and historical record of all actions. This history can help you identify the flaws in procedures to improve them for the future. This history can also act as an accountability mechanism. And just like checklist content should be constantly improved, we want to improve the experience as well. So give MiraCheck a try and share your thoughts with us. A collection of videos showing the capabilities of MiraCheck - the latest appear first. Doing pattern work or practicing approaches? This video shows using linking to reset a subset of the items in your checklist. It also shows using Yes / No questions to link to other parts of the checklist. Get rid of the noise! You can apply filter tags to checklist Items, Sections and Lists. For example, if you have some items that are only needed for when you are flying IFR, or some items only needed for flying at night. 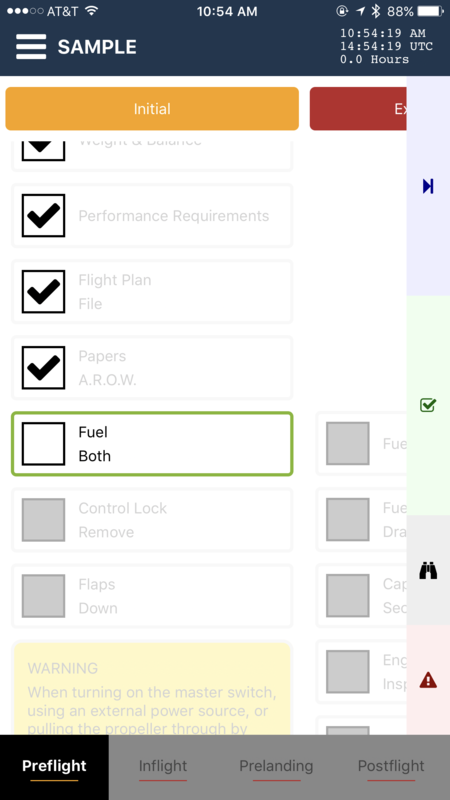 This allows you to have a streamlined checklist for your mission each time you run it! See the benefits of a large, complex PDF document converted to MiraCheck. A walkthrough of the new Form Item features. A checklist for engine diagnosis to incorporate in your aircraft. 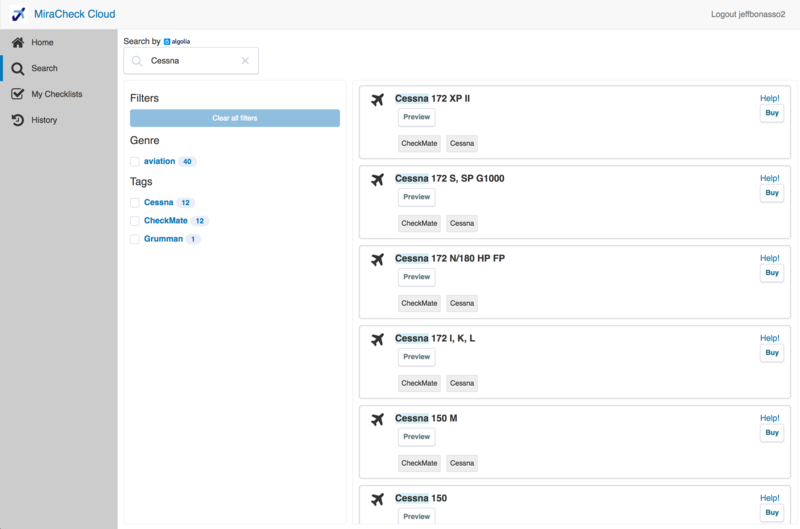 Some new linking capabilities of MiraCheck, where you can link to external checklists as well as internally within checklists. 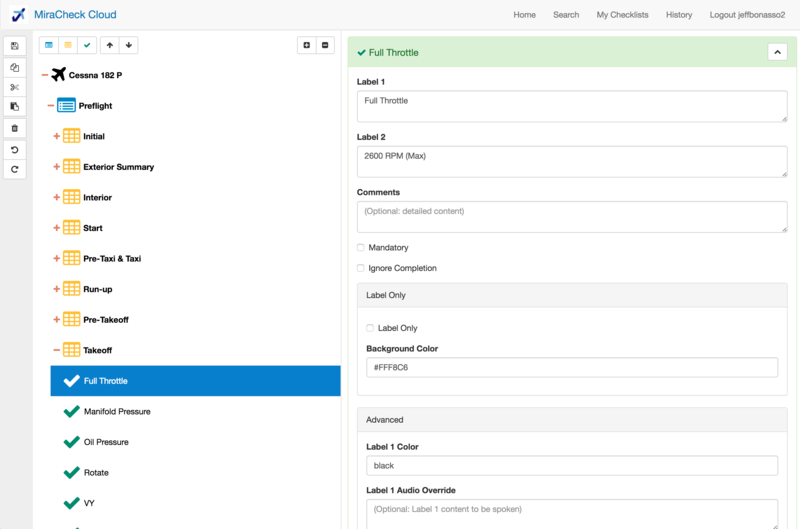 Shows advanced branching capabilities as well as new options for styling Section headers. This short video goes through some recent new features. 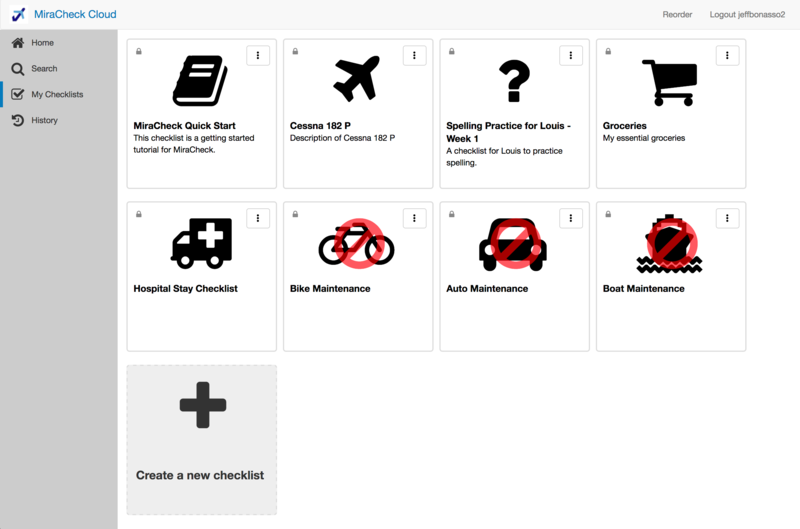 This tutorial shows how to create a new checklist in MiraCheck. In the November 2017 AOPA Pilot Magazine, Jeff Van West presented a brief that he does before each flight, and we have converted it into a MiraCheck checklist. Greatly improved multitasking in iOS 11 using MiraCheck. A walkthru of the amazing voice capabilities in MiraCheck. A demonstration of MiraCheck in the harsh cockpit environment with a bluetooth headset. Learn about the new History, Flight Timer and Notes features of MiraCheck. Those that fail to learn from history, are doomed to repeat it. 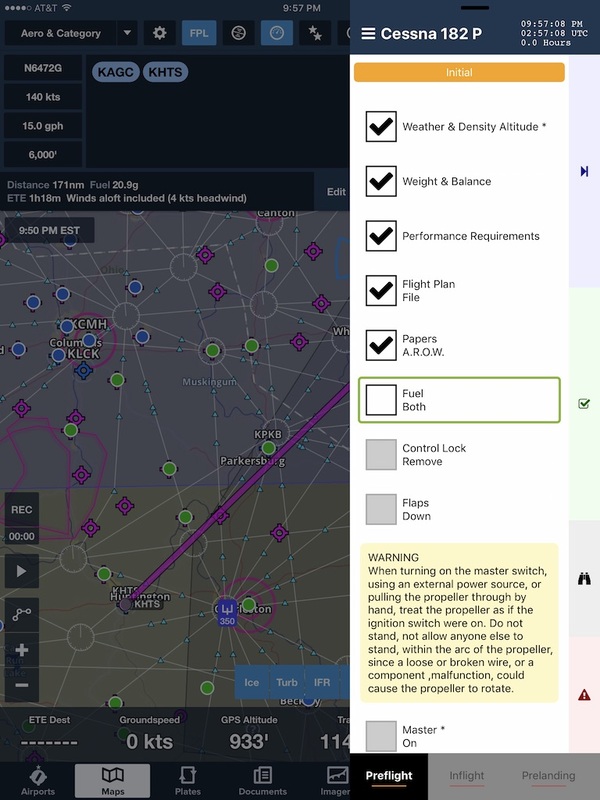 Shows how to add the IMSAFE checklist to your airplane in MiraCheck. Demonstrate pause / play capabilities when Mira is reading a section. A quick overview of the mobile app in action. An in depth walkthrough of the capabilities of the mobile app. An in depth walkthrough of the capabilities of the cloud app. © 2018 Miralou Aero LLC. All Rights Reserved.